Tell me, what is Christmas without some classic tunes? Because for me my fondest memories of the festive season revolve around the sounds of an old cassette tape my mother picked up for a few cents at a trash and treasure market one Sunday morn. At the time I remember rolling my attitude laden young eyes at her because Christmas music was so lame; especially the old school kind. Why couldn’t she invest in something cooler like Mariah Carey? Little did I know that the melodies of Frankie Vaughan, The Kaye Sisters and Rosemary Squires would soon become much loved favorites on my Christmas playlist for many years to come. For me Christmas doesn’t feel “right” without this tape playing in the background of my parents old Sony stereo. There’s something about those old world tones and words about merry nothings and cheer that never fail to bring a smile to my dial; despite the horrendous sound quality of a nineties cassette tape. Which is why I made a point to add these songs to my Christmas playlist. I guess it takes you back to a simpler time where people were amiable and not reliant on technology for entertainment and connectivity. Where families and friends gathered for lavish dinner parties and brandy by the fireplace and sung by the grand baby piano. Though this may be far from the truth, that is how I envision such a time to be regardless. People revelling in each others company with nothing but kindness and merriment to be had. If only todays world mirrored that slightly. Do you have a favorite Christmas song this time of year or find you have certain traditions that make it truly festive? 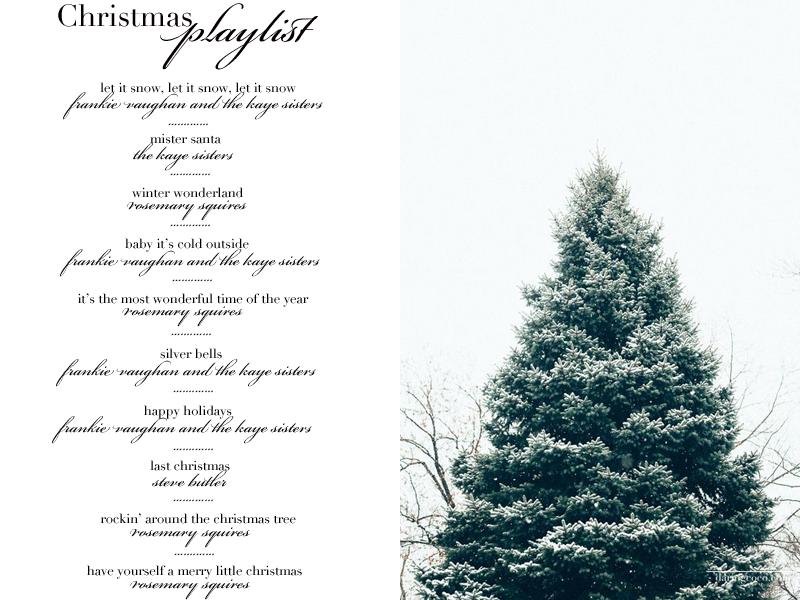 I’ve shared my Christmas playlist for you above. I hope it brings you much joy during the silly season.